A local store had nice looking strawberries for a good price the other day, but when I brought them home I was disappointed in their taste -- they weren't sweet at all. So I decided to make jam. My kids love my raspberry jam the best, but this is a close second. Can you see my husband's reflection in the jar? I just used the recipe from the Ball Pectin box so I haven't included the recipe. Just make sure you have about 5 cups of strawberries, lots of sugar, and about 1/4 cup of lemon juice. I used about 1-1/2 pounds of strawberries. So if you get some not so sweet strawberries, make some jam. Looks so yummy. I think hubby was posing!!!! I heard (and tried) something else too. Fill a bowl or the sink with the hottest water you can get out of your tap. Let them sit in the water until they are warm through. It sweetens them and kills the bacteria so they won't mold as quickly in the fridge. I was amazed how it worked and didn't make them soggy like it would my homegrown ones. 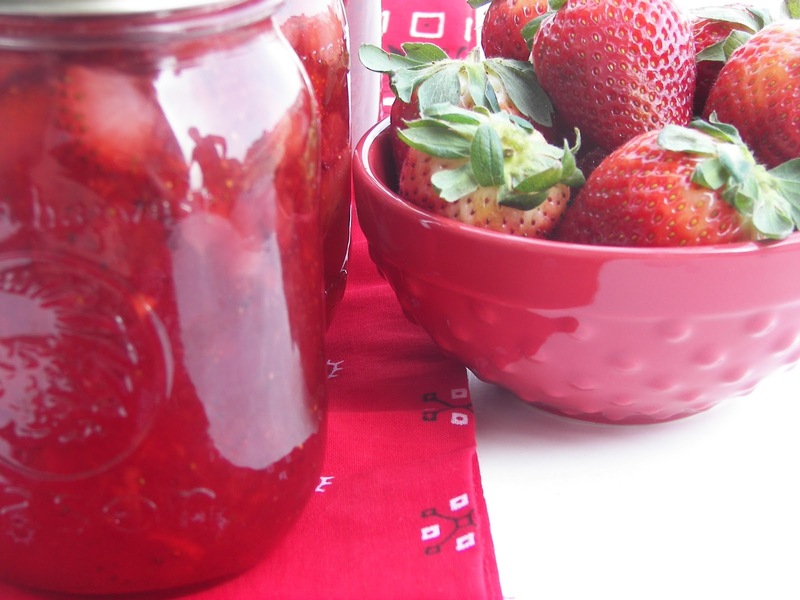 Homemade strawberry jam is the best stuff ever. I can't eat store bought because I have been spoiled all my life. This makes me look forward to warm weather even more!! What a great idea, Joni! Thanks! Fresh strawberry jam sounds so good. I might have to make a batch of freezer jam this year when the berries are ready. I haven't done that in several years. Your jam looks so pretty in the jars! I am so ready for spring. I still have lots of strawberry jam but do plan on some others. Can't wait for canning time! That's a good way to use them up. Love your hubby's reflection! Your house must have smelled so good! Joni, Your jam is so bright red and gorgeous! I'll bet you and your family will enjoy it very much. Your jam looks beautiful! 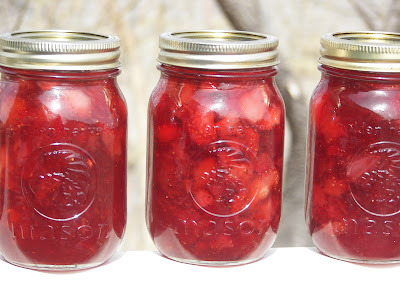 Reminds me of all those days picking berries with my grandpa and making jam with my grandma! The tradition continues with my daughter. Such nice memories! Pass me a slice of bread please. Your photos are beautiful.